Our Celtic Stag necklet is made by and exclusive to Love from Skye on the Isle of Skye. It’s elegant, graceful form, created by intricate Celtic knot-work, suggests the shape of a powerful, grand Scottish stag’s head. 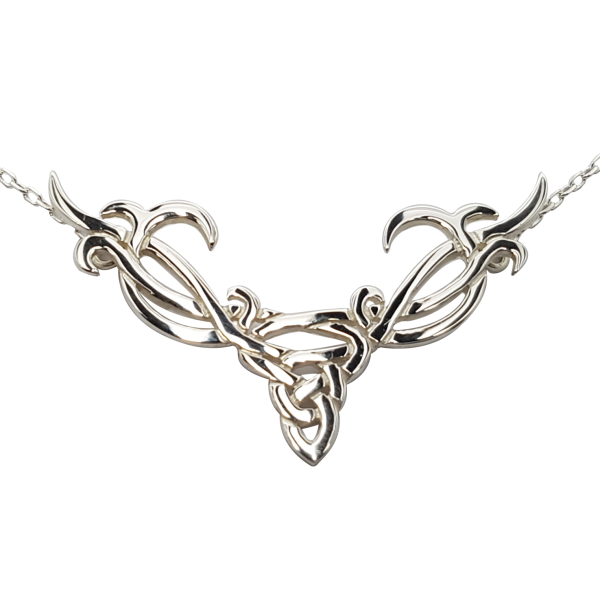 This open knot-work necklet measures 55mm x 35mm and is presented on a trace chain which is attached to the reverse of the necklet, creating a total length of 18 inches. My wife saw this when we visited Skye recently and “hinted” that she really liked it…..I have just received my web order and will squirrel it away till Christmas….. It is a fantastic item, very unique and very well made. It arrived very well boxed, even with a red ribbon which was a nice little touch. I know she will love wearing this as it is a bit special…… Thanks. I fell in love with this necklet when I saw it on their facebook page and had to have one. It’s absolutely gorgeous, well made and everyone comments on how unusual and beautiful it is. We were in Skye this summer and I saw an ad for this necklace. It is prettier than you can tell from the picture. It is a beautiful piece of art. When I got home, my daughter saw it and said that if she had one, she would wear it every day. She will get hers for Christmas. I love the necklace I have. Everyone in the store was wonderful. I think this is one of the prettiest necklaces I have seen in years.